Hey all, I have something REALLY cool to share with you today! I've been asking my oldest daughter to draw up a sketch of herself (forEVER) and this weekend she surprised me with the finished drawing!! YAYYYYYY...I'm so excited!! I posted some of her other artwork on my blog in the past...HERE is a sketch she did of her little sister, HERE is a drawing that was featured in an art show during her senior year (also of her little sister's feet and hands), and you're all familiar with that cute peanut bee character that's up in my blog banner....she did that too. 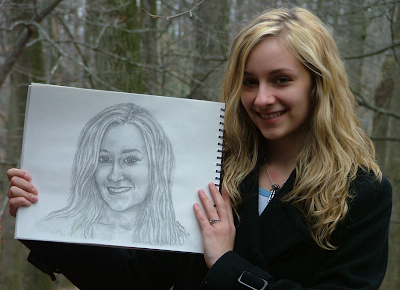 Here she is along with her self portrait. I think she did a FANTASTIC job! Pretty much everything on my card can be found at Stamper's Dream. Everything that's currently available in the store is linked in the supply list below. All panels are up on separate layers of Dimensionals. The pearls started out as plain white. I colored them with my RV42 Copic to match the colors in the image. 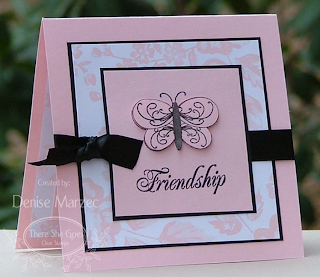 After cutting and embossing the tag, I left the die in place and sponged Pretty in Pink ink around the sentiment. Oh, and Michelle is going to have BLOG CANDY posted to her blog on Monday, Wednesday and Friday!! You won't want to miss it! Ha...did that title get your attention? Yeah, sounds yummy to me too. The "Island" is this Island Mist Prism CS (and it might just be my new favorite Prism color) and the "Cheesecake" is this CUTE Penny Black Cheesecake Party image. I love Penny Black stamps! They're so cute and SOO fun to paper tole. The image was stamped three times in Memento Tuxedo Black on Neenah White CS, colored with Prisma Pencils (boy, I haven't pulled those out in a LONG time), and then layered on Dimensionals...the full image is layered twice and then the cupcake with the candle is layered a third time. Yellow stickles were added to the flame. The layout is Taylor's TECC61 sketch. A lot of the things on my card can be found at Stamper's Dream. Links are in the supply list below. Don't you love one stop shopping?! I do too! Hey all! Have you been to Jessica's blog lately? 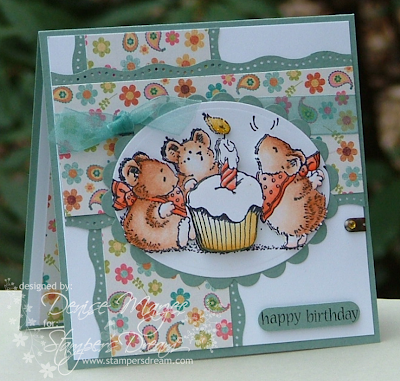 Did you see that there's a way for you to try and win some free TSG stamp sets? That's right, just CASE one of the retiring TSG team members (that would be me, Bev, Steph and Wendy), link up to THIS POST on Jessica's blog by the end of this month and you'll be entered. I thought it'd be fun for my last post as a TSG team member to CASE all THREE of my fellow TSG girls. 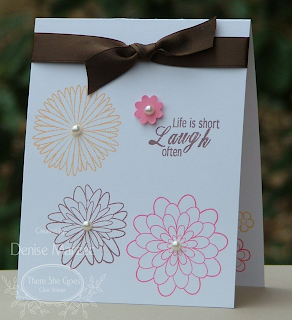 I chose to CASE Bev's Happy Flowers card, Wendy's Sending You My Love card, and Steph's Upsy Daisy Window card. Beautiful cards! I made a couple Taylored Expressions cards to show you today, both using the Easter Key Ingredients. 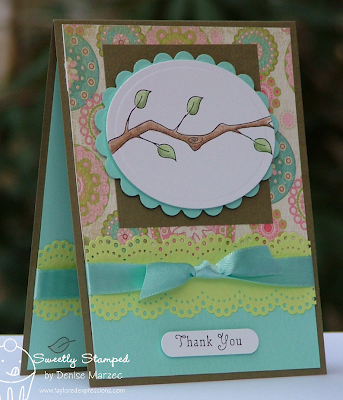 The first one is a thank you card using the new Branching Out set. The Prism papers and DP are from the Easter Key Ingredients and the pretty Caribbean ribbon is left over from my Valentine Key Ingredients pack. Do you still have some left over too?...check it out, it goes with the Prism Frosted Teal CS. The layout is Jen del Muro's SFYTT from March 14th. The main oval panel, scalloped oval behind it, and sentiment are up on Dimensionals. I watercolored the branch with ink and watered down Angel Wings Shimmerz. 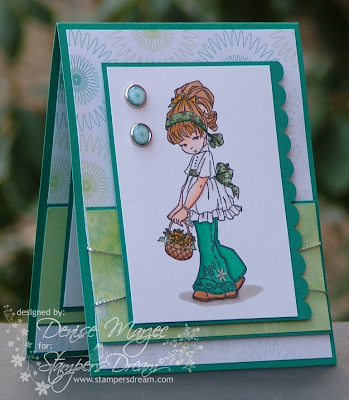 The next one is an Easter card using the new Sweet Spring set. The Prism papers and DP are from the Easter Key Ingredients. The sentiment, main oval, and scalloped oval behind it are up on Dimensionals. The pearls were originally white. I colored them with my RV23 Copic marker. The layout is Taylor's TECC60 sketch from Friday. 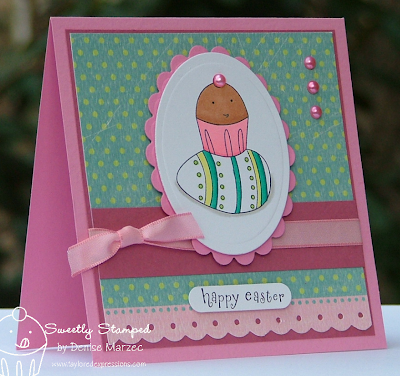 I'll have another SASI/Easter Key Ingredients project to share with you on Thursday on the Stamp a Sweet Impression blog. I hope you'll have a chance to stop by. Seriously?! Beate hasn't been the Featured Stamper already?? Wow! Well, not that it matters because haven't we ALL done a little Beate CASE'ing already? I know I have...she's a rock star! 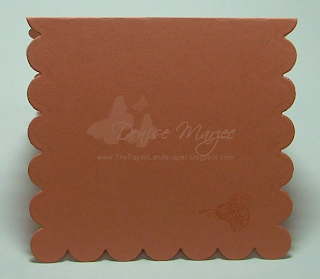 I chose to CASE Beate's Guava Rose card. I kept the same '08 in colors, just changed the order a little. I also used a different pattern from the Afternoon Tea DP and used a large square nestie panel instead of a large rectangle, only because I don't have those. I would have loved to use the textured Guava DP like she did, but I didn't have any of that either. Oh, and I just realized I FORGOT to do the piercing around the oval panel. Totally meant to do that, oops! Folded Measurements: approx 4" x 3.75"
Did you see Kristina Werner's Color Inspiration and Cami's Weekend Sketch...they both looked like so much fun, I had to play! The square ladybug panels are up on Dimensionals and so are the Riding Hood Red squares behind them. I added some watered down Shimmerz to the ladybugs while watercoloring them. 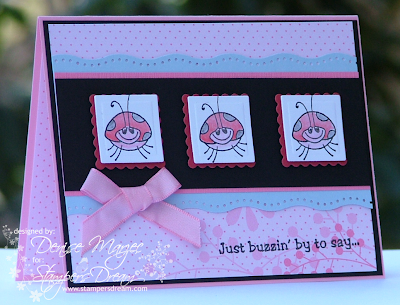 On the inside of the card, I added a panel of the Sweet Always DP and stamped another ladybug in the lower right-hand corner in Regal Rose. 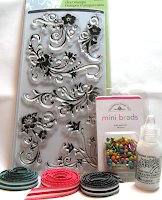 Our Craft Lounge stamps are available at Stamper's Dream! Wanna know what else is NEW at Stamper's Dream?...Michelle just stocked a bunch of brand-spankin' new JustRite products that were just released. Check it out HERE and be the first to get them. Hi everyone! Every Friday, the TSG team members take turns making a project with something that costs one dollar (or less) and the tutorial gets posted on Jessica's blog. Yesterday was my turn! Since I used a picture of my little cutie pie, I wanted to post it here too. I went with pink and orange colors to match what my daughter was wearing in the picture. I love this sweet picture of her. It was taken last June at a picnic with her mommy-and-me preschool class. I had her dressed in pink for the picnic, and then when we got there they had all the kids put on these orange t-shirts that they had made in class. That's it, easy peasy and ready to be decorated! This month's Dirty Challenge for the DD/DDA is a REEEEALLY fun one! We were asked to go back to our very first SCS upload (or one of our oldest) and remake the card! How fun is that!! Have you ever gone back and looked at your very first uploads? It's pretty fun....and funny...and a little embarassing, LOL! Details of the Challenge: A CASE of one of our oldest cards. Just like the regular featured stamper challenge, we have to change some things on the card...but we need to be able to see the subtle changes. No restricted elements. Here's my new card. The main image was cut out and popped up on Dimensionals. The chocolate nesties panel and the punched sentiment are also up on Dimensionals. Here's the original card from May of 2007....that's some loose ribbon, huh? Yikes! What's the same: I kept the same layout, pink/brown combo, used an image with flowers, plaid ribbon, and brads in the same place. 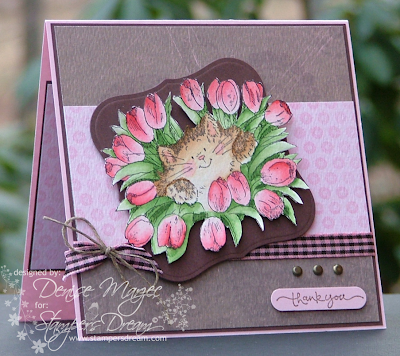 What's different: The image is watercolored, I used a Spellbinders panel behind the main image, I moved the sentiment and popped it up on dimensionals, DP was used in place of a stamped background, I added a bow, and made it a square card. Oh, and I also finished the inside...something I pretty much always do now but I didn't back then. Hi everyone! Jessica is having a Change of Seasons Sale today through Tuesday, March 24th on four stamp sets: Crafty Taglines $12.75, LOL Taglines $18.70, Welcome Home $18.70, and Special Delivery $12.75. 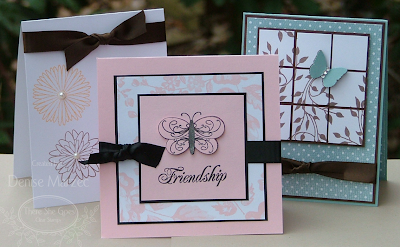 To celebrate the sale, we've made cards today using these sets. I was assigned the Special Delivery set. If you'd like the set, hurry over to the TSG Store and get it while it's on sale. I added some Angel Wings Shimmerz to the mailbox, flag, and grass. The polka dotted DP panel is up on extra thick (1/8") foam tape. I'll be back at 8 a.m. with a card for the monthly Dirty Dozen/Dirty Dozen Alumni Challenge. 'Til then! Hi everyone! 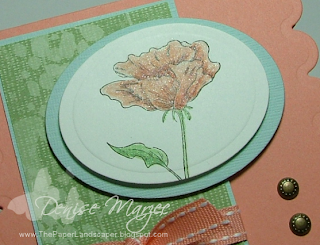 It's time for the Stamper's Dream monthly challenge! 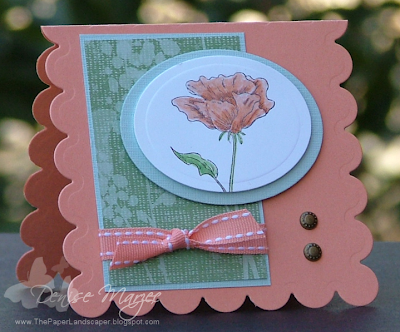 This month Michelle challenged us to CASE a member of the Stamper's Dream DT. You're welcome to play along! Just chose any member of the Dream Team and CASE one of their cards. Just like the Featured Stamper Challenge on SCS, be sure to change a couple things to make it your own. 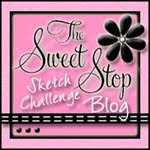 Post a link to your project on Michelle's blog...she's going to have a DREAMY TREAT for one lucky participant! If you upload to SCS, use SDDC6 in the keywords. We were each assigned a different team member to CASE. I got to CASE Laurie!! Whoo-hooo!! Oh my word, I'd love to CASE ALL of her cards. You totally ROCK, Laurie! I love your style! I chose THIS CARD of Laurie's to CASE. I kept the same basic blue/red color combo, layout, and a Stampavie image. She used a Stampavie Rachelle Ann Miller image, called My Little Friend...I used a Stampavie Sarah Kay image, called My Sweet Lili. Laurie also had REAL stitching on her card...ahem, I can't sew....so I faux sewed. One of these days, I hope to do real stitching...some day. The main image is up on Dimensionals and then the scallop oval behind it is up on a second layer. The Classic Red Prism paper, Versafine Onyx Black ink, and Penny Lane Freebird DP (striped and floral prints) that I used on my card are also from Stamper's Dream. Have an awesome day and good luck in the drawing! Okay, today I made a couple notecards for yesterday's Timeless Tuesday challenge, which was to use ribbon, and I combined it with today's SCS sketch challenge. The daffodil sentiment is from Signs of Spring and the Just Because sentiment is from the Siberian Iris set, both from Flourishes. 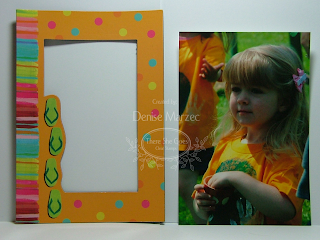 The white curved mega rectangle panels as well as the punched sentiments are up on Dimensionals. That's it for today, short and sweet! Have a good day and I'll see you tomorrow with the monthly Stamper's Dream challenge. 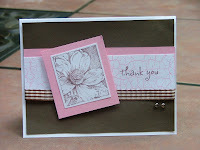 Then I'll be back again on Friday with a TSG blog hop card and the monthly DD/DDA challenge. Oh, and before I forget....have you been to Taylor's blog and have you seen the new Key Ingredients Subscription Program?? Hurry over and check out her post for all the details. 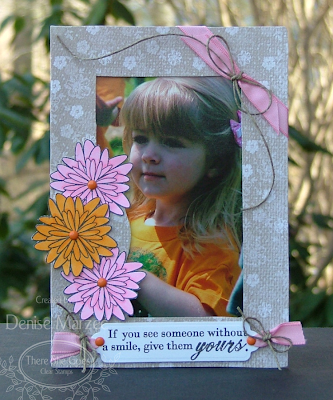 CONGRATULATIONS to Stacy (twinshappy) for being today's Featured Stamper! I love Stacy's gallery!! 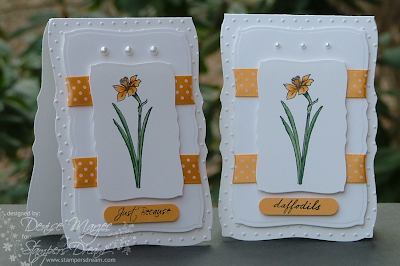 I chose to CASE her gorgeous set of daffodil notecards. 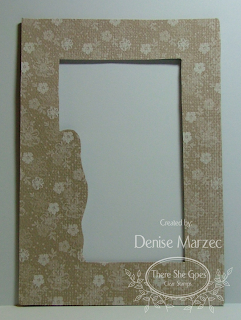 I used my curved mega rectangle Nestabilities like she did and went with a floral theme. 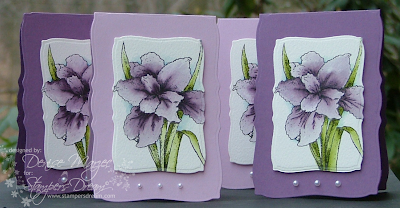 I just chose a different Flourishes set, Siberian Iris instead of Sweet Spring. I also changed the colors and used Kaiser Craft adhesive pearls instead of brads. You can get the Siberian Iris set, Versafine Onyx Black ink, Kaiser Craft pearls, and curved mega rectangle Nestabilities at Stamper's Dream. 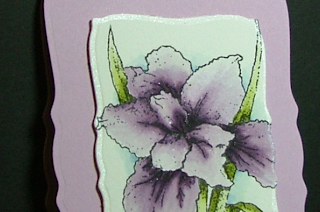 My flowers are watercolored with SU markers and Lilac Shimmerz. Rather than painting the Shimmerz directly onto the flower, I mixed it with some water on my brush while doing the watercoloring...it thins out the Shimmerz a little more. Stacy added glitter to the edges of her curved rectangles, so I edged mine with Angel Wings Shimmerz paint. The floral panels are up on Dimensionals. I added a white curved mega rectangle panel to the inside of the Perfect Plum cards...just because writing probably won't show up on the darker colored CS. Hey all! Long post warning...I have two cards to show you today with some new Whiff of Joy images that I got from Stamper's Dream! The stamp on the first card is called Willow Kneeling. 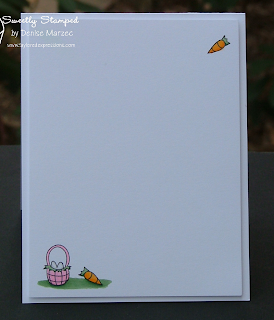 It's a 5" square card and the layout is Karen Giron's SSSC07 Sketch. The main image circle, scallop circle behind it, and the white square on the base are all up on Dimensionals. 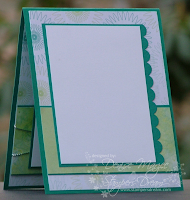 The Spirograph DP, Spirograph Brads, Teal Prism Paper, Pearlized Mini Brads, and sentiment (from Flourishes Siberian Iris) are all available at Stamper's Dream too. The stamp on the next card is called Willow with Flower Basket and I used more of the Spirograph DP/Brads on this one too. The layout is Karen Giron's SSSC08 Sketch. The teal mat behind the main image and the green horizontal panel are each up on separate layers of Dimensionals. I added some sparkle to the flowers in her head band, ribbon around her waist, and her bracelet with my Sakura Stardust pen. My niece's fifth birthday party is today so I'd better get a move on. Enjoy your day!! 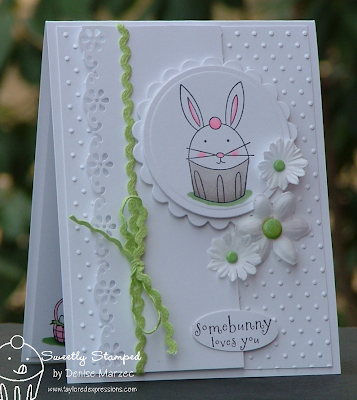 Today I wanted to make a card with this cute bunny from Taylor's Sweet Spring set. 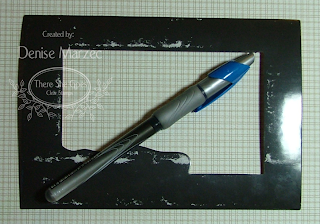 The layout is Amy Rysavy's Sketch #53 and I combined it with Sharon Johnson's ssnotime78 challenge, which is to make a card with white mats. I took it to the extreme I guess and did ALL white, LOL! The main bunny circle, scallop circle behind it, center prima, and the panel with the white punched border are each up on separate layers of Dimensionals. The green ric rac ribbon and the large green sparkly brad in the center prima are from the Easter Key Ingredients at Taylored Expressions. Here's the inside of the card. The white panel here is also on Dimensionals.